← Happy Valentines Day …. 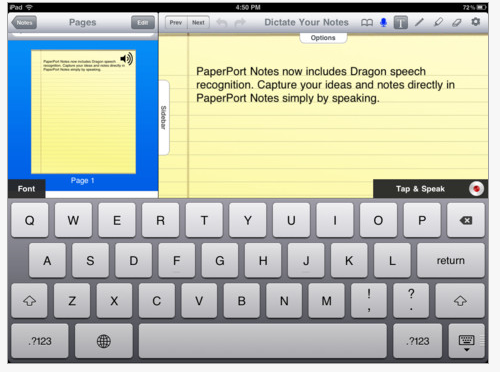 Paper Port App – Dragon Dictation App on Steroids! Are you impressed with the Dragon Dictation App? Well, you will love Nuances new PaperPort app that has Dragon Dictation tools in it! 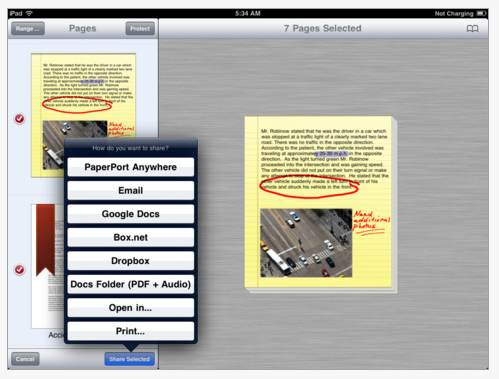 PaperPort App – This is Nuances new free digital note taking for your iPad (only iPad) that captures hand written notes, typed text, images, web content and audio. PaperPort Notes even allows you to take advantage of the Dragon Dictates voice recognition software to produce your ideas and notes simply by speaking. Wi-Fi connectivity is needed for the voice recognition and transferring documents to function. Paper Port provides many options to transfer your note to make it retrieveable in other applications such as Google Docs, Dropbox, email or their own document management app called PaperPort Anywhere (also free). Being free, this is a must to check out if you have an iPad and individuals that would benefit from using voice recognition on the fly. A huge benefit is not only the voice recognition but the ability to use the iOS5 speak text option, allowing the text to be read back to you with text to speech to review or access your voiced production. It was also very easy to use, easier than many of the note taking apps I have trialed. This is such a powerful and free tool for middle, secondary and post secondary students if they are not already using Dragon NaturallySpeaking on a computer and need something simple and brief to voice their thoughts and ideas into. Wondering what voice commands work with Dragon Dictation app? Check out an earlier OT’s with Apps post dated October 10, 2011 for a listing of compatible voice commands and other Nuance resources. A powerful tool for your OT iTool Kit if you work with middle school or older students/individuals. Try it yourself, if not with your students! This entry was posted in App Reviews, Apps for OT's, Apps for Special Needs, High School, iPad, Learning Disability, Middle School, Occupational Therapy, Post secondary, Special education, Uncategorized, Voice Recognition and tagged App Review, iPad, Learning Disability, occupational therapy, OT Apps, special education, Text to Speech, Voice Recognition. Bookmark the permalink. 4 Responses to Paper Port App – Dragon Dictation App on Steroids! paperport is one of my favorite apps!! it also allows you to record notes while taking plain notes/outline or on a powerpoint. and syncs notesvto eac page! .. and import pdf files for students to fill out worksheets! i was so excited when i saw the dragon addition..but i am having trouble with it …once i dictate i can only dictate additional text at the end of already dictated text…cant edit a word by highlighting and dictating over it or add a sentence at the beginning or middle of text… i dont have these issues in dragon? are you experiencing the same issues? thanks for your AWESOME blog i tell every OT i can about it! Karen, Yes, I find the same thing, the dictation enters at the end of the text. You can take the text and copy it to where you want to in the text. Perhaps they will be fixing that in upcoming versions. It is amazing however. The fact that you also can use speak text is fabulous!